Start by leveraging the power of your existing social network first. If you’re active on facebook, let your friends know about your new blog by sharing every new post on your timeline. Politely ask them to like, comment and share your post. What’s next? Create a facebook fan-page for your blog and invite all your friends to like the page – Don’t hesitate, it costs nothing. Send invites to all of them – At least some of them will definitely like your page. Then start posting relevant, useful and engaging content on your fan-page. Adopt a similar strategy on other social networks (especially Google+ and Twitter) as well. This will lay down a foundation of visitors for your blog. At this stage your blog should start to take off from ZERO visitors to at least 10 visitors per day! Don’t have many friends on social media? Are you finding it difficult to get your friends to read your blog-posts? Then, VCB and Just-Retweet could be your best friends. Provided that you have created awesome content, these two websites will never let you down – i bet! Check out my review on viral content buzz to understand what it is and how it can help you with traffic on your new blog. Just-Retweet is a very similar concept. Don’t have any idea about guest blogging? Don’t worry, start from here. Start by searching for well established and popular blogs in your niche and check whether they are accepting guest posts or not. If they are open to guest contributions, go through their guest-post guidelines to understand what exactly are their requirements and what do they expect from you as a guest blogger. Then spend a few minutes going through some previously published guest articles there. Check the quality of the content and the level of reader-engagement through comments and judge yourself if you could be a good fit or not. This is a screenshot from Google Analytics that shows how traffic on Budding Geek shooted up by 1340% in just a day. It was 15th of August 2012, when my guest post at Problogger (one of the top blogs in my niche) went live. 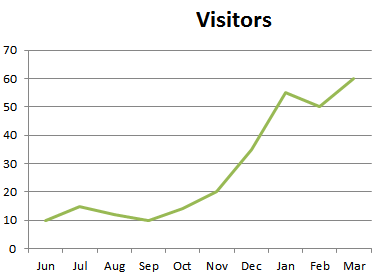 My blog received 360 unique visits on 15th itself. And earlier, it used to receive just 25 visits a day on an average! Phenomenal, isn’t it? Do you have a friend who is into blogging? Politely ask him for help/assistance. If he also blogs in the same niche, he may probably help you by introducing your new blog to his own readers or he may also invite you to contribute as a guest blogger on his blog, thus providing you with an opportunity to attract traffic to your new blog. And even if he doesn’t blog in the same niche as yours, he may help you by providing valuable tips and resources to attract visitors to your new blog! 5. If nothing works – Advertise! Finally, if nothing works, you should resort to advertising. Advertising, though an expensive option, has the potential of attracting quality prospects to your blog – people who are genuinely interested in checking out your blog/business. The most popular and probably the most effective way of advertising is through Google Adwords. Here’s a detailed guide that walks you through the entire process of advertising through Google Adwords. Do you have any questions regarding these basics of driving traffic to a new blog? Drop them in the comments below, I’ll be glad to help.